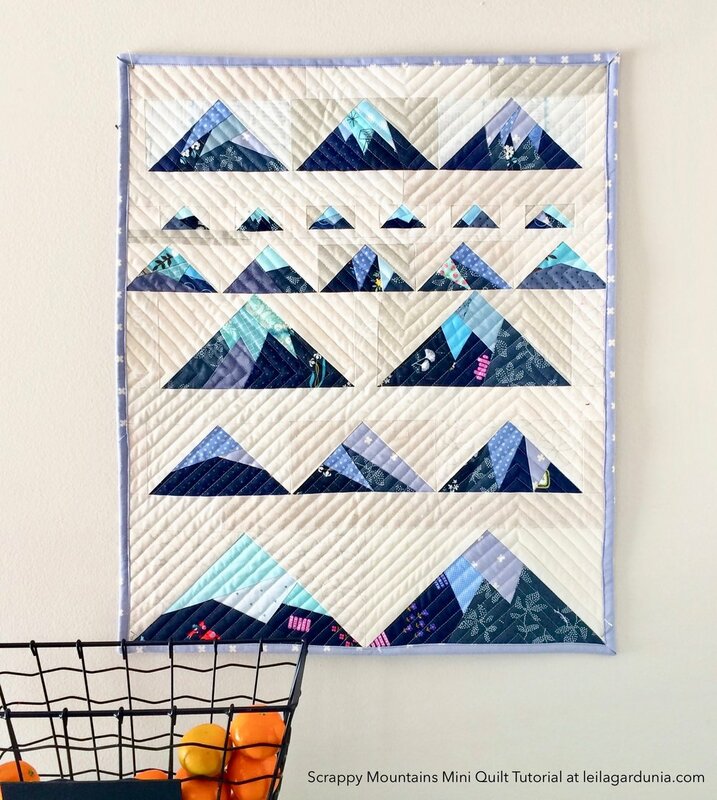 Last month I released foundation paper pieced patterns for these Scrappy Mountain Quilt Blocks. People have been having so much fun playing with them! I can’t wait to see all of the outdoor themed quilts and projects made with these. I think they would look great on zipper pouches, bags, purses, pillows, and more. They are also great if you are looking for something a more masculine quilt pattern for your boy/man. The Scrappy Mountain foundations come in five different sizes and can be purchased in my shop. The Scrappy Mountain quilt blocks can be mixed and matched in anyway you want. Really, the sky is the limit! But sometimes that can be too many options. To get you started, I thought I would share a tutorial for the Scrappy Mountain Mini Quilt I made. It measures 20” x 24” and would make a cute quilted wall hanging. If you want something larger, make four of these mini quilt tops and sew them together to make a small 40” x 48” throw. This would be a great size for a baby or toddler quilt. Need something larger? If you make 9 of them they will make a 60” x 72” throw. Just have fun and play around with these mountains. That’s the goal! * Patterns for the Scrappy Mountains can be purchased in my shop. Layout all Scrappy Mountains and background pieces as illustrated. 3. Press. When two Scrappy Mountains are sewn together, press the seams open. 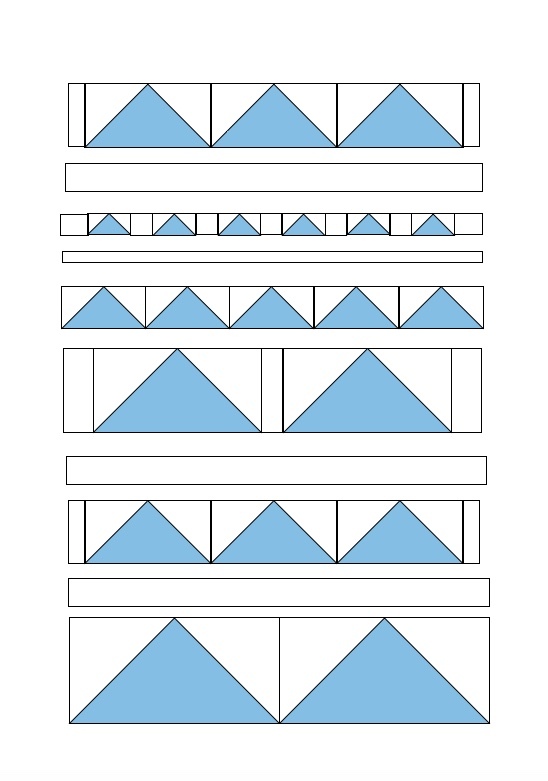 When a Scrappy Mountain is sewn to a background strip, press towards the background strip. 4. Sew the Scrappy Mountain rows and the long 20 1/2” strips together. Press towards the strips. Now you can baste and bind the quilt as desired. I quilted my mini with straight line quilting. I played with the line direction and want to show you how I did that. The first thing I did was mark a line with a disappearing fabric ink pen. I started in the lower left corner and went up through the quilt at a 45 degree angle. Then I stitched on the line. After marking the secondary lines, it was time to sew again. I sewed parallel to the first line and, when I hit the second marked line, I stopped, needle down, rotated the quilt 90 degrees, and sewed on the second marked line. I did the same for the third line. After the major lines were sewn, I just filled in the rest of the quilt with straight line quilting. I sewed parallel to the previous stitching lines and used the side of my walking foot as a guide. I hope you have fun making this mini quilt! If you are new to foundation paper piecing and aren’t sure about it, you can find step by step instructions here. 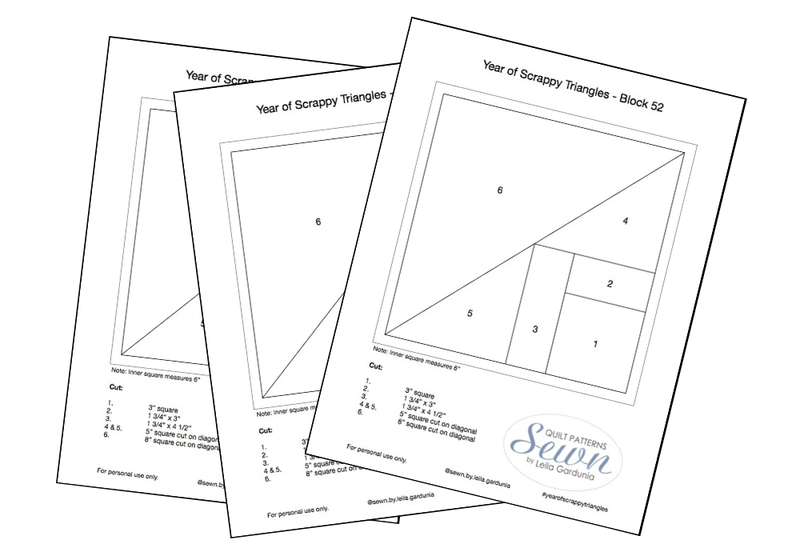 If you want to give it a try, download 52 FREE Scrappy Triangle paper pieced patterns to play with here. They are a great scrap buster and an easy way to ease into foundation paper piecing.